Tokiwabashi Bridge (常盤橋) and Edo Castle’s Sotobori outer moat (外濠) in Nihonbashi, Tokyo. In the center background is Tokiwabashimon Gate (常磐橋門). On the far left Kurebashi (呉服橋) is visible. On the right is an official bulletin board (高札場, Kosatsujo). Tokiwabashimon was Edo Castle’s entryway to the Oshu Kaido (奥州街道), a major highway connecting Edo (pre-1868 Tokyo) with Mutsu Province (陸奥国, area around Fukushima, Miyagi, Iwate and Aomori Prefectures). It was one of the “five entrances to Edo” (江戸五口, Edo Itsu Kuchi) which connected Edo Castle with the five major highways. The merchant quarters of Nihonbashi, which became the heart of Edo, grew up and prospered outside this gate. From 1873 (Meiji 6), the stone walls of the gate were partly demolished. The remains were designated a Historic Site in 1928 (Showa 3). 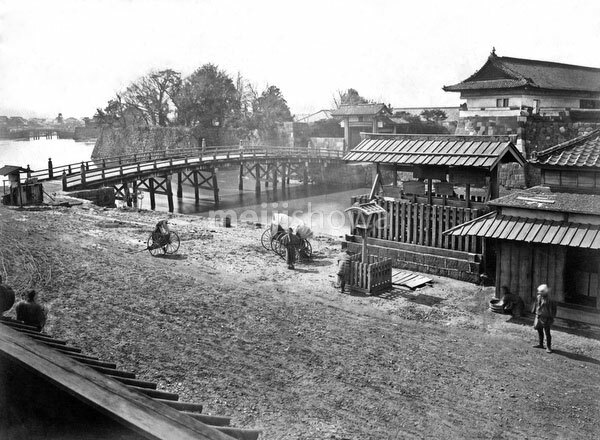 The wooden bridge was replaced by a western-style stone structure in 1877 (Meiji 10).